Summer 2013: Beaches. Water fights. Flip flops. Lemonade. Sunglasses. Late nights. Ice cream. Warm air. Bonfires. Pool parties. Barbecues. Blue skies. No school. Memories. Summer is the perfect time for family vacations with the great weather offering endless outdoor activities to do together. Some people go to Disney world; some go to Yellowstone. Some spend the day at Valley Fair and it’s usually a jam-packed trip. If you’re thinking about ways to entertain your kids in a more low-key, comfortable place, you may be thinking about a second home or vacation home. Whether its out of state in the sunshine of Arizona or more local on the lake or in the woods, below are a few tips and tricks to finding the perfect place for you and your family. Escape to a place that will feel like home, but with the carefree-ness of being on vacation. Let’s face it, Minnesota’s weather can be crazy and unpredictable and even though it’s summer now, investing in a place out of state can be a great thing come winter – not to mention it’ll be more of an adventure to travel to! The first thing you want to do is find a good realtor to help you look out of state. Buying property long-distance is always stressful and it may be challenging to find something on your own while you’re sitting in Minnesota. Use referrals and find someone you trust. Also talk to your lender. (This goes for all real estate investments.) Decide if this new home will be in your name as a second or vacation home, or if you plan to split it with other family members, friends, etc. and how you plan to structure the purchase. Will you rent it out while you’re back in Minnesota or will it stay vacant? Remember that real estate transactions vary state to state. Land of 11,842 (or so) lakes! Although the idea of traveling out of state may sound appealing, Minnesota is already the perfect setting for vacations year round. If you’re thinking about buying a cabin on the lake, you’ll be set for family vacations and getaways with the kids until they have kids… and their kids have kids! 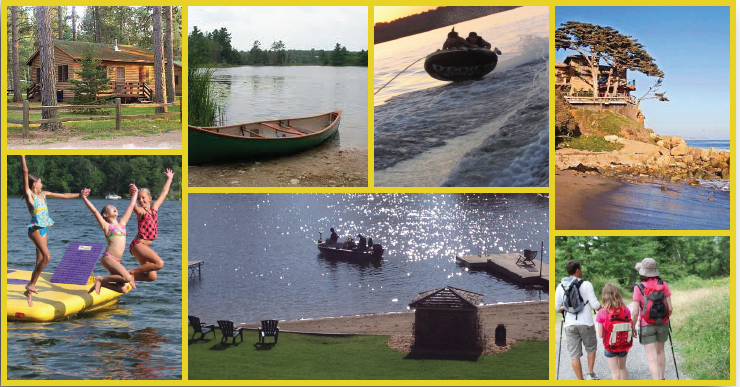 Boating, swimming, fishing, great views…. not to mention Minnesota Nice will allow you to make friends with your neighbors on the water. Sounds ideal right? The value of your real estate purchase will most likely be decided by the quality of the lake and condition of your lakeshore. You’ll want to think about how you’ll use the lake. Is the lake fully recreational? Will you have a boat? Can you dock it? What kinds of covenants restrict you from installing the right kind of dock? You’ll also want to talk to the neighbors to learn what they love about the area and the lake… and what they don’t love about it. If you prefer the peace and quiet of the woods, maybe a hunting cabin is the way to go. You can still bring the family and escape to a place where you’ll get to think creatively for activities. A property on the lake is obvious; lets get out on the water! A place in the woods, you can go hiking, play games outside, or get competitive with some board games indoors. No matter what kind of property you’re interested in investing in, be sure to make full use of it! The summer is in full swing, and the memories are just waiting to happen.